Social Quarters – Page 4 – Horace Orr Post 29, Inc.
At the convention in June, the Auxiliary won a quilt that was the Department President’s project for the year. 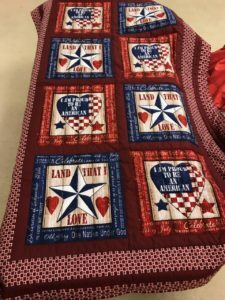 We will be raffling off this quilt during the month of August, with the winner being chosen at the Labor Day picnic on September 3rd. Tickets will be $2 each/three for $5. See a member of the Auxiliary to participate.